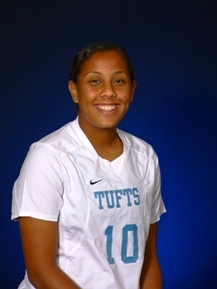 SOMERVILLE � After losing for the first time in a month on Saturday, the Tufts women�s soccer team rebounded with its best offensive output of the season on Wednesday afternoon against Keene State College at Kraft Field. Led by two goals from sophomore Cara Cadigan (Nahant, MA), the Jumbos posted a 5-0 victory against the Owls. A 1-0 loss to Trinity on Saturday stopped an eight-game Jumbo win streak that tied for the second longest in team history. This afternoon, they scored three goals in the first 18 minutes and cruised to the victory on Seniors� Day. Tufts is now 10-2 overall, while Keene State fell to 8-7-1. Cadigan and sophomores Fanna Gamal (Albany, CA) and Ali Maxwell (Exeter, NH) provided the bulk of the offense. With the two goals, Cadigan now has 13 on the season and sits two shy of tying the single-season Tufts record of 15 by Lisa Raffin in 1981. Gamal had three assists against Keene and Maxwell scored a goal and assisted on two others. Meanwhile, the Tufts defense did not allow the Owls a quality scoring chance. Jumbo goalkeepers Kate Minnehan (Hopkinton, NH) and Hannah Jacobs (Mill Valley, CA) split the squad�s sixth shutout of the season. Minnehan made one save in the first half and Jacobs had five when Keene applied more pressure in the second half. Cadigan scored twice less than a minute apart for a 2-0 Tufts lead in the 14th minute. Less than four minutes later, Maxwell netted her second of the season for a 3-0 advantage. Lauren Fedore (East Lansing, MI), one of seven seniors playing in their last regular-season game on Kraft Field, had the fourth Tufts goal early in the second half. Sophomore Sara Raley (Centennial, CO) capped the scoring with her first collegiate goal in the 83rd minute. Ashley Molloy (Manchester, NH) stopped five shots in the Owls� cage, while senior Kathleen Keniston (Minneapolis, MN) paced the offense with four shots.